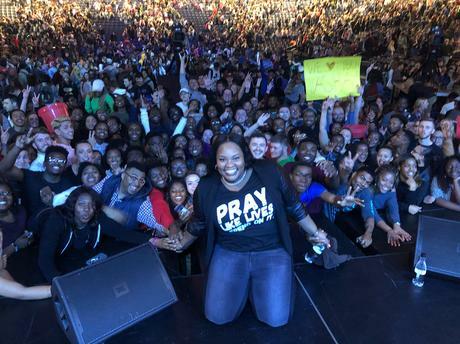 Tasha Cobbs Leonard leads Praise & Worship at Liberty University Convocation Monday morning. Cobbs-Leonard song her Gospel hits, Break Every Chain, The River Of The Lord, For Your Glory, Put A Praise On It, Tasha also took those in attendance and watching online back to the Old Landmark by singing old hymns. Held each semester, the Convocation is the assembling of the student body and staff leadership in order to inform, and inspire. With over 13,000 in attendance and thousands more watching online and on television, Liberty University’s Convocation is the largest weekly gathering of college students in the world. Tasha also shared while they were in worship a Liberty University student received healing in her hospital room.